Robert K. Ace Jr. Construction has over a decade of experience building quality custom homes in the Poconos & Lehigh Valley. We offer a wide range of custom home designs and options to meet all of our clients’ unique building needs and lifestyles. Whether you are looking to build your first home and anticipate the needs of a growing family, or whether you are looking for that special secluded luxury home with all of the upgrades for retirement, we can work with you to create the home that will go above and beyond your expectations. When you choose Robert K. Ace Jr. Construction, we build the home you’ve always wanted, whether it be a luxury custom home, quaint waterfront home, custom log home, mountain home, custom ranch home, or custom modular home. The possibilities are limitless. We have custom home designs ranging from small homes to large luxury homes and everything in between. We just need your vision and we can work out the specifications to make it a reality in the Lehigh Valley and Poconos. Robert K. Ace Jr. Construction respects the high value you place on seeing your dream realized and the significant investment of time and resources you make when having your custom dream home built. Some people plan on their new homes for years before they break ground. Other homebuyers come to us frustrated that the real estate market didn’t provide the home they were looking for and are ready to just build it themselves. Others fall in love with a specific piece of property and want us to build on a lot they have already purchased. We pride ourselves in being able to assist you in customizing and realizing whatever plans you may have. Property, pricing and location are all important considerations. From choosing the perfect location for your custom home, to the design phase, to the final day of inspection when we as your homebuilder hand you the keys, Robert K. Ace Jr. Construction is there to assist you each and every step of the way. Robert K. Ace Jr. Construction places top priority on clear, timely, and effective communication in relationships with our homebuyers. We realize how frustrating it is when communication fails and how that can impact the success of your home building project. By providing personalized consumer attention and all of the input of that data into our programmable files, we have all of your needed information accessible across platforms for our collaborative teams of subcontractors be they framers or drywall installers, electricians, roofers, or plumbers. We eliminate breakdowns in communication by assuring that each member of your team is working hard toward the goal of finishing the project on budget and on time. We give you an informed and comfortable experience when building your custom home in the Poconos & Lehigh Valley. We serve the Pocono Mountains in the counties of Monroe, Luzerne, Lehigh, Carbon, Pike and Wayne and the Lehigh Valley counties of Lehigh, Northampton, Schuylkill. Where visitors come to play, but our residents enjoy the residential amenities year-round from snowtubing and skiing to waterparks or secluded lakes. The Poconos & Lehigh Valley is a beautiful place to build your new custom home. When talking with Robert K. Ace Jr. Construction, you know what fits your lifestyle and you can have fun designing your own space with a network of architects. Set your focus on baths, the kitchen, basement, garage, increasing overall square footage or accessibility. You can choose the number of bedrooms, add custom closets, obtain themed fixtures, and design utility rooms. Are you dreaming of a media center, outdoor living areas, patios, spacious dining areas, granite countertops, cabinetry, full custom kitchens? We listen to your desires and add your chosen level of customization and amenities in your floorplan. All options are available and again, the possibilities are endless. The opportunity to finally have the perfect home built with quality is assured by the experience, past success, and personal attention of our team. When we start on your new construction, it will be located in the neighborhood, lakefront community, or lot of your choice, so it’s the right setting and convenient for your lifestyle. Customers always tell us how important it is to get the features they want, implemented by an established, certified, builder throughout their new home. Pocono & Lehigh Valley Home Prices Beyond Your Reach? You may think custom homes prices in the Poconos & Lehigh Valley and Lehigh Valley are beyond your reach, but with us, you will find you too can building your custom dream home anywhere from Stroudsburg to Blakeslee, Lake Wallenpaupack to Camelback in Tannersville and everywhere in between. Of all the purchases you make, becoming a homeowner is the largest decision and financial outlay for the majority of people. Our highly skilled tradesmen have years of quality, master craftsmanship and custom home building experience. We work together as a highly-functioning,seamless team to expedite the building process, saving you both time and money. From assuring that your HVAC ductwork is installed right the first time to assuring that your cabinetry and countertops are personalized to your specifications. Our mission is to provide the highest quality products, with superior service, on a schedule, and at practical prices for our customers. We build relationships and partnerships with the highest level of professionalism and honesty. People say we are reliable and trustworthy, always operating in integrity with our customers, vendors, subcontractors, and each other. We have built an outstanding reputation as a premier builder in the Poconos & Lehigh Valley. We stand on a firm foundation having built high quality, luxury, log, modular, and custom homes, while working hard to earn our clients’ trust and satisfaction in each and every one of our homebuilding projects. When you contract with Robert K. Ace Jr. Construction you can have the peace of mind that comes from working with a premier homebuilder who make integrity and quality workmanship a priority. Whether you’re relocating to Pennsylvania from a breathtaking oceanfront condominium in California or live in nearby New York penthouses and are building a contemporary vacation home. We’ve helped clients from many places worldwide. If building a new home is not the right decision, Robert K. Ace Jr. Construction will work with you to renovate your existing home, or Poconos & Lehigh Valley townhome by providing custom solutions to suit your needs. You may already have the perfect location and you just need a few upgrades to meet the demands of your changing lifestyle, and we at Robert K. Ace Jr. Construction can help you do just that. We are a luxury and custom home builder who works with you to create a completely unique, custom home with a floorplan that will fit your unique lifestyle and needs. Some of our clients in both the Lehigh Valley and Poconos would rather not make all of the decisions that go into designing their own custom home, but prefer to leave those decisions to an experienced architect. If that is the case, you can also choose from one of our great pre-designed packages. Our sophisticated clientele has proven to appreciate these homes as we prove ourselves in exceeding their expectations. These homes can include custom modular comparable homes and even specially tailored pre-made home plans. We specialize in all types of Pennsylvania’s best residential construction and have vetted each and every one of our subcontractors to know they will provide the standard of service which exceeds our expectations. Before we call anyone else onto the jobsite, we make sure they have the immediate availability to complete your project in a timely manner. Whether you are looking for a starter home, vacation home, second home, or a home to relax in during retirement, we can walk you through the design process. You can choose one of our predesigned Lehigh Valley or Pocono packages right from your iPad, or you can create your own custom luxury design, personalizing it to your customized specifications. Remodeling your kitchen or bath has never been easier. At Robert K. Ace Jr. Construction we listen to your needs. We make it our mission to assist you the customer to acquire your desired outcome and to surpass your expectations. Please visit our kitchen and bath showcase. 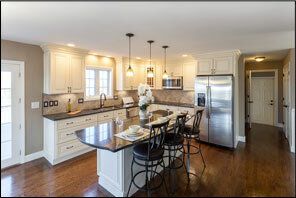 RKA Construction specializes in all types of residential construction & remodeling. Whether you're looking for new construction or wish to remodel and update your existing home, let our expert team walk you through the design process to help you create your dream home.